At Delivery Biz Pro (DBP), we offer more than just delivery routing software. We offer full-service home delivery management software dedicated to helping you to put as many eggs in your customers’ baskets as possible, so to speak. After all, why have a delivery software if there is nothing to deliver? DBP’s services include a well-designed website to use as your customer marketplace. This website is completely customizable, ensuring that whether you are delivering propane tanks or ready-to-make meals, the website looks like it was made for your specific industry and business — because, thanks to our stellar web team, it was! When it comes to creating a successful business centered around recurring deliveries, having an easy way for customers to find you and purchase products is essential. When customers can see what you have to offer and navigate your website, they are more likely to spend time putting items into their carts. We know that you have a stellar product and amazing service, but customers might not be aware of that if you have an outdated or complicated website. In today’s blog, we are going to discuss some key components that customers like to see when they visit an online marketplace. Keep reading to learn more, or, if you want to hop on the phone with us and see if our delivery management software is right for your business, feel free to get in touch! People in this day and age are incredibly visual. It’s why videos get more views than blogs and more hours are spent scrolling through Instagram to look at pictures than actually reading the captions. Within two seconds of your homepage loading, customers should be able to tell what you’re selling. Big headlines saying “Farm Fresh Milk” or “Home Water Deliveries” will tell a potential customer what your business can offer them faster than a cluttered homepage with no organization and too much going on. Customers, whether we like to admit it or not, can judge a website with a glance and are not afraid to hit that ‘back button’ to return to their Google search to find a more reliable-looking service. A website that looks like it’s from 1999 will make customers think they have gone out of business or that they haven’t updated their payment security since 1999 as well. Some people believe that a good product will sell itself, but if you can’t keep a customer on the site long enough to realize that you do, indeed, have a good product and that you do have a safe checkout system, it’s not going to be enough. Speaking of checkout systems, have you ever tried to order something from a local business’s website and became so frustrated with the checkout process that you gave up entirely? A well-designed website avoids this mess by making checkout as intuitive and as simple as possible. We can also set up your website to send out email confirmations when a customer checks out, automatically add them to a delivery route, and more. These little details tell a customer that a business has their stuff together and that they are a business they can continue to trust to provide them with a service. Let’s say your website utilizes a shopping cart feature that allows customers to put items in their cart and make edits later before a final check out. Well, if you have a button below a product that says “Buy Now,” that’s a little confusing. Will their credit card on file be charged the moment they click that button? Will clicking that button automatically schedule a delivery? If you use a cart system, have a button that says “Add To Shopping Cart” so there is no hesitation. It only takes a moment of hesitation to lose a sale. Making things clear, concise, and understandable allows customers to take control of their purchases, and the more control they have, the happier they will be to click that final “checkout” button. If your website looks amazing on a desktop but is hard to navigate on a smartphone, you are missing out on a huge portion of your potential customers. Delivery Biz Pro’s customer marketplaces are designed for mobile first, meaning they will adjust to fit the screen size of the device the website is being viewed on, and may even have a completely different layout on mobile devices to help customers find what they need regardless of the size of the screen. Many customers will make their final purchases on their phones, and others will search for businesses on their phones and move to a desktop or laptop to finalize orders. In this world, you truly cannot afford to not be mobile compatible. Ready To Chat? Let's Talk About How DBP Can Help Your Business! If you own a local dairy, you likely know exactly how many gallons of milk you can provide to customers — after all, if you have had the same number of milk-producing cows for the last six months, you can roughly determine how much supply you will have at any given time. Our delivery management software features inventory management that can automatically update certain items with an “out of stock” banner. While it may sound counterintuitive to have options on your site listed as unavailable, it is better than having to let a customer know that an item they purchased actually will not show up on their doorstep. Plus, it shows customers that the business they are purchasing from is regularly updating their site, which is always a good sign. Our delivery management software and customer marketplace helps you and your customers be on the same page at all times. We’ve followed this theme throughout this blog and we want to hone in on it a little more. 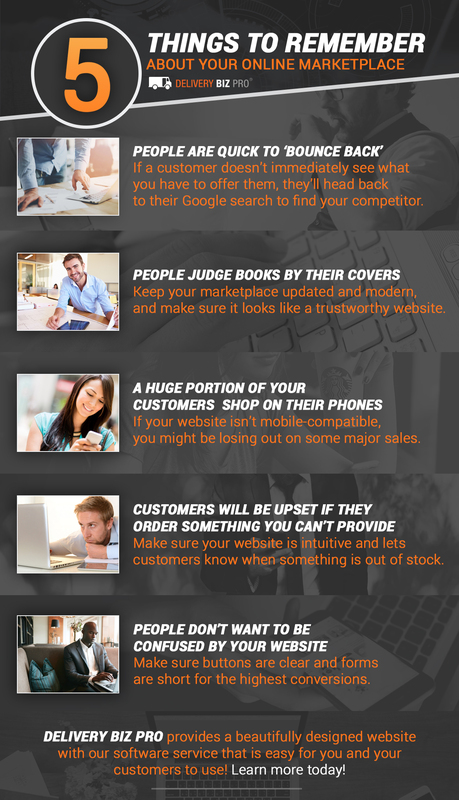 Customers might not always know what they want, but they certainly know what they do not want and they aren’t afraid to close out of your website if they see any red flags. Our goal when designing a customer marketplace is to avoid anything that might be a red flag for a customer. Through years of data, research, continuing education, and being humans ourselves, we know a thing or two about what customers like to see and have access to on a website and what makes a business’s website seem trustworthy. With a DBP customer marketplace, your customers will have easy and clear email communications, intuitive signup processes, automatic order confirmations, coupon codes, delivery reminders, account history, and more. Even though you may be a small business, we want your website to have all the bells and whistles that the “Big Guys” have. The web developers at Delivery Biz Pro are here for you day and night to ensure that your business is always running smoothly. Just like we don’t make “one size fits all” websites, we don’t make “set it and forget it” websites, either. 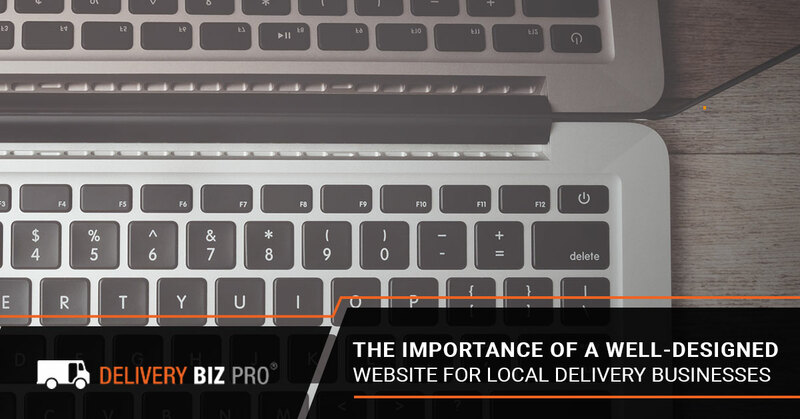 When you sign up with Delivery Biz Pro, we don’t just create a website and leave you to figure out what to do with it. With us, you gain access to a team of IT professionals, designers, and web developers who are here to help with whatever you need, from design changes to promotional materials to general IT help. Getting a DBP customer marketplace is included in our services — meaning you get a custom website at no extra cost to you. When you trust Delivery Biz Pro as your delivery management and routing software, you truly work with a full-service software and web development company who is here for you no matter what. Our goal is to set your business up for success so you can focus on providing your customers with the services they need. To learn more about working with DBP, take twenty seconds to fill out our application and we’ll schedule a time to hop on the phone with you and talk more about using our delivery management software.